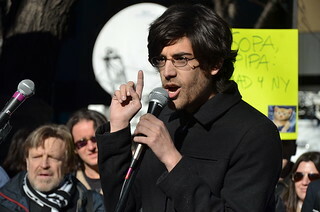 Image: Aaron Swartz by Daniel J. Sieradski via okfn. "Those with access to these resources — students, librarians, scientists — you have been given a privilege. You get to feed at this banquet of knowledge while the rest of the world is locked out. But you need not — indeed, morally, you cannot — keep this privilege for yourselves." - Aaron Swartz, Guerrilla Open Access Manifesto. As a means of tribute to Aaron Swartz, his beliefs, and a form of online civil disobedience, more than 1,500 links have been posted on twitter to copyright-protected research. The links are collected via the #pdftribue hashtag and can be found at the site pdftribute.net. Video: F2C2012: Aaron Swartz keynote - "How we stopped SOPA"
Aaron Swartz was heralded as a young genius who co-authored RSS at age 14 and later started a company that would morph into Reddit. He also was proponent of greater access to information, and he allegedly took that position when downloading over 4 million academic articles from JSTOR with the intent to distribute without permission. Andrea Peterson at Slate pondered if Aaron's apparent suicide might be a catalyst for mainstreaming open access journal practices. With over 13,000 researcher signatures boycotting Elsevier, another large academic publisher, momentum is gaining for research to be more widely available--not just to the a minority that have institutions that can afford subscription costs (and even they sometimes can't meet those financial demands). Open access' value proposition is that the removal of subscription fees and keeping copyrights with the authors will increase access to information. One solution is to have the journal costs paid by the author(s) through research grants. The problem is that publishing in well-respected journals where the likelihood of citation is greater is tied to the researchers' requirements for tenure, and those journals are typically subscription based. So, while previous movements to dismantle the subscription system (including petitions with over 30,000 signatories have occurred), none have created widespread change. With growing dissent for subscription-based, academic journal distributors and recent ideologies like the Anonymous and Occupy movements, we may see a cultural shift that Aaron called for in his Guerrilla Open Access Manifesto . Interestingly, and not surprisingly due to looming litigation, the manifesto is no longer on Aaron's site. Although traces on Google can be found by searching site:aaronsw.com "guerrilla open access"